In the present SHIP applications are suited by well-established technologies covering the range of process temperatures found in different industrial sectors: low (T < 100ºC), medium (100ºC < T < 250ºC) or high temperature (250ºC < T < 400ºC). 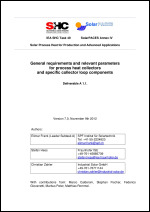 Considering that solar collectors suiting industrial processes might also suit non-industrial applications (e.g. hot water production on the Residential sector or high pressure steam for power generation purposes) it is important to establish the scope of a Solar Process Heat Collector. In the present SHIP applications are suited by well-established technologies covering the range of process temperatures found in different industrial sectors: low (T < 100ºC), medium (100ºC < T < 250ºC) or high temperature (250ºC < T < 400ºC). Considering that solar collectors suiting industrial processes might also suit non-industrial applications (e.g. 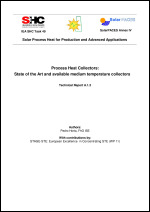 hot water production on the Residential sector or high pressure steam for power generation purposes) it is important to establish the scope of a Solar Process Heat Collector in various terms. 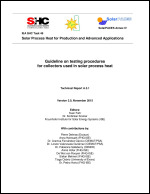 To enable solar thermal technologies to successfully enter the important market of process heat applications, it is crucial for the manufacturers to be able to provide reliable figures to succeed in tenders, to be able to predict energy yields with sufficient accuracy and to be able to prove liability in operation. All of this requires commonly agreed key figures and testing procedures to provide these. 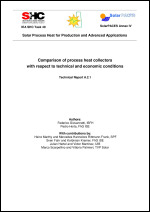 Solar process heat plants need to be able to operate reliably in all operation modes. 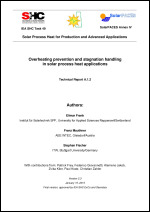 Other than for conventional closed hot water or steam supply systems, solar thermal applications require specific technical solutions to cope with the phenomenon of stagnation.